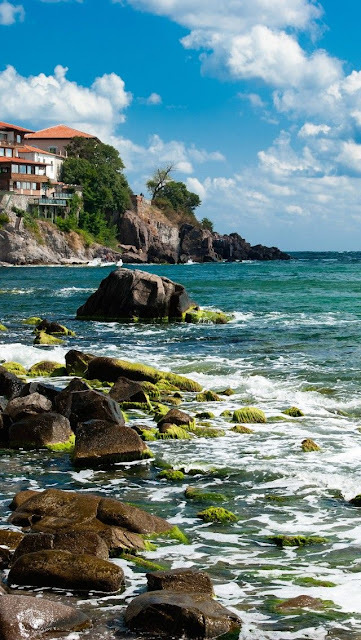 Black Sea Coast , Sozopol, Bulgar. The Bulgarian Black Sea Coast covers the entire eastern bound of Bulgaria stretching from the Romanian Black Sea resorts in the north to European Turkey in the south, along 378 km of coastline. White and golden sandy beaches occupy approximately 130 km of the 378 km long coast. The region is an important center of tourism during the summer season, drawing millions of foreign and local tourists alike and constituting one of the country's most popular tourist destinations. Prior to 1989 the Bulgarian Black Sea coast was internationally known as the Red Riviera. Since the fall of the Iron Curtain, however, its nickname has been changed to the Bulgarian Riviera.